I could feel these beautiful Priests hearts praying for me, praying out of a desire to protect me, to shield me from any pain as evidenced by my tears, and if that was not possible, to have God intervene so that I would no longer cry. Good and holy priests, with hearts like St. Joseph, loving, protecting those in your charge. Yet this heart was also like our Lord's, that is their hearts were on the cross. Not only did they wish to protect me, but they hurt in their heart for me, taking on my pain and I could feel that too. This is why a priest reflects Jesus crucified into the world, because of a Holy Priests love for those to whom they have been given charge of. These good and Holy men, anointed by God to the Priesthood were willing to take on my pain so I would not continue to suffer. What love this is. 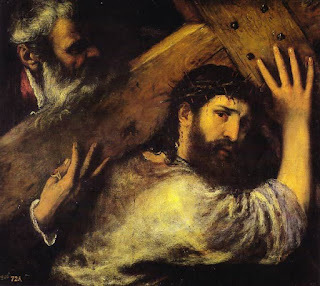 This is why a priest doesn't just carry his own cross, but out of love for you he carries a little bit of your cross too.